You can help to protect the health of our marine ecosystem this Easter simply by selecting sustainable seafood for your holiday feasts. This week fishmongers will be hard at work to meet the demands of the many Australians who choose to eat seafood in honour of the popular Good Friday tradition. Marine Campaigns Officer Tooni Mahto from the Australian Marine Conservation Society (AMCS) is encouraging consumers to think before they buy when it comes to seafood. The UN Food and Agriculture Organisation (FAO) estimates that 80% of the world’s fish stocks are now over-exploited or fished right up to their limit, and we have lost 90% of the world’s big fish from the oceans. The AMCS is working with consumers, chefs, restaurants, seafood retailers, supermarkets and government to achieve fully sustainable, well-managed Australian fisheries. “We work to ensure we can exist in equilibrium with our oceans for the future of our marine life and the communities and industries that depend on a healthy marine environment,” said Ms Mahto. 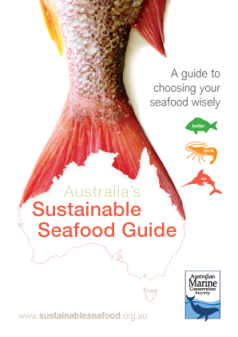 Consumers can assist by making the right choice when purchasing seafood by using ‘Australia’s Sustainable Seafood Guide’ developed by the AMCS. “We launched the first consumer guide in 2004 in response to requests from the public for a road-map as to how to navigate the complexities of choosing seafood responsibly,” said Ms Mahto. Since the initial publication, there have been four updates, passing on the most up to date information possible to consumers. “In late 2010 we launched the most recent version of the guide which contains analysis of more seafood species and enable us to keep up with current information and is available on our website.” said Ms Mahto. Sustainable seafood is a resource taken from the sea, or grown in a farm, which is harvested without harming the environment whilst maintaining a healthy population of the target item. Individuals can make a difference to the health of our local Surf Coast Environment by ensuring they ask their fishmongers how and where the fish they are buying is caught, and choosing the sustainable option. “Consumer power is massive – what we buy tells those up the seafood chain what values we hold most important,” said Ms Mahto. For an accessible introduction into the issues surrounding sustainable seafood, visit the AMCS’s website www.sustainableseafood.org.au. The guide can be purchased on-line for $9.95. This story was written by the Great Ocean Road Coast Committee and published in the Surf Coast Time’s Going Green Column.